Back to the drawing board, BBK? Would this setup be suitable for a full weekend at COTA for a novice? Any concern about the oem rotors holding up for 10 sessions? Have stoptech sport pads on oem rotors in good shape. If run this kit would you use pfc11 on the rear? Also have stoptech sports out back still fairly new. BBK would eventually happen - would that money be better spent making the jump now? I use PFC V3 DD rotors front, stock rear rotors and PFC 08 pads all around on cota with no fade at all. I’m only running about 2:40 though. How is your pad wear like? Stock rotors seem eat pads and BBK seem to extend that to 10-12 events. I'm assuming PFC would put it somewhere in between. I’ll take some pictures when I get home. I only run the 08s on the track then I swap to PFC Z rated for street. What are your thoughts on the 08s vs 11s? I went ahead and made the switch to the rotors and 11s before cota a couple of weeks ago. Had no fade either but not running as fast as you. Had a blast, such a cool feeling driving & being at that track. Actually back up here for F1! I’ve never used the 11s before but I can tell you that you would not want to use 08s on the street, they’re obnoxious. With stock calipers and rotors, SRF, Ferodo 2500 F&R, steel lines, etc, I went through a set of fronts in two track days of 5 20-min sessions each. The rotors were also slightly warped after the 2nd day. Three or four times towards the end of each day the brakes would cease to function well at the end of fast straights. I'm lucky to have "gone off" on those straights multiple times, so my life didnt flash before my eyes, but it wasn't fun to barely make it. 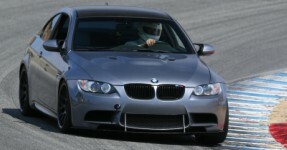 Contrast that with the current BBK that uses F80 front rotors ($500 a pair). I went 10 events this year with a single set of Ferodo DSUno F/2500 R pads and the F80 rotors look like they've got less than a few microns of wear. Next year I'll buy another $500 in pads, $70 for another pint of SRF, and go back to riding anti-locks through my braking zones. As mentioned, a good BBK will honestly save you money. I don't actually have an opinion on what BBK one should use as long as the F/R bias is well thought out for your tires of choice. They all have 10 minute pad changes (I swapped the F pads to 2500's after each event for the street), and they all stop you repeatedly better than stock. It's probably 95% about the thermal capacity of the bigger rotors, but I'm not sure. I just really appreciate thinking about things other than brakes during my track days. What pad shape # are you running for the DSUno on f80 rotors? The shape Slonik suggested didn't come in a DSUno option. Drives: Too many cars, never enough. Does anyone have any feedback in regards to this front brake duct kit with stock calipers and a track/street compound pad? It's garbage. Falls apart after a few track days. Damn, I really thought this would be a great solution to reduce heat and save me a few bucks. Have you used this kit, what exactly falls apart? I have a similar ducting kit on one of my other cars and it gets scratched and banged up but it has been on for several years and it works great. I think Visceral ran it with poor results. Hard Motorsport then turned their back on him when he reached out.